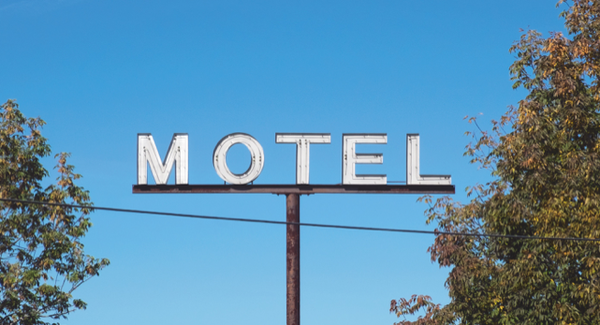 Author Susan Bregman has been photographing neon relics throughout New England for years. Read on to learn more about some of the signs that didn’t make it into her new book, New England Neon, and some of her favorites to track down! For the past few years I’ve been on a mission to photograph New England’s neon landscape before it disappears. I’ve highlighted many of the region’s best – and most well-known – signs in New England Neon, along with a few that have seen better days. You’ll find beloved signs like the iconic CITGO sign in Boston and the red-and-blue beauty that welcomes visitors to Weirs Beach in New Hampshire. But inevitably, some signs did not make it into the book. It was not from lack of appeal; it was usually from lack of information. The stories behind some signs were just lost to history. Burlington, Vermont is home to a number of well known signs, and you’ll see many of them in New England Neon. 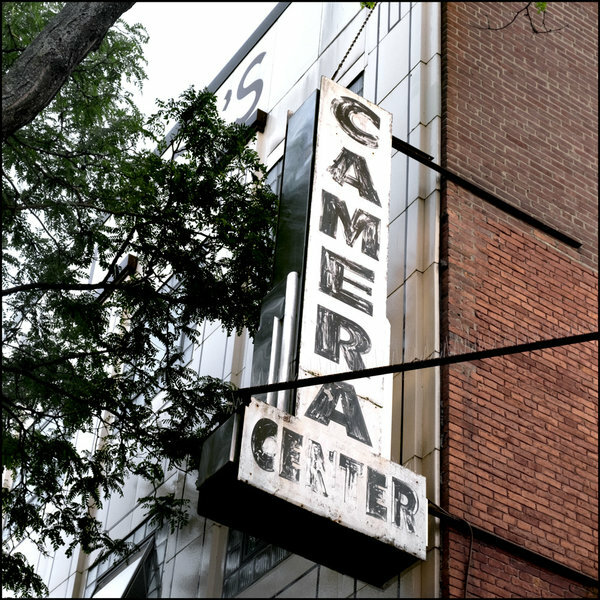 But I was also charmed by a simple black-and-white blade sign that read Camera Center. (Blade signs are mounted perpendicular to the building.) The sign was Art Deco in style, and that’s where the story ended. Was it ever neon? Probably. Did it advertise something before Camera Center? Who knows? The camera center photo in Burlington, Vermont. Image by Susan Bregman. 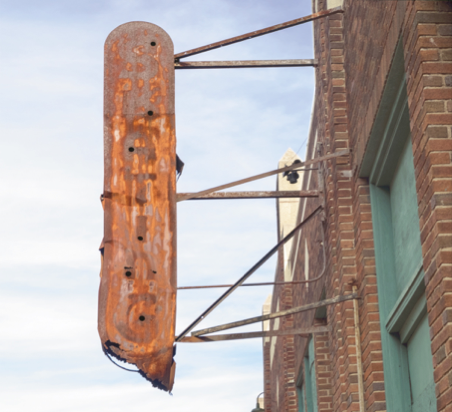 I found the same thing in Worcester, Massachusetts – a seemingly forgotten neon blade sign on a downtown street. The Check Cashing sign looks to be from the 1940s. It’s a little banged up, but it still has some neon tubes. It currently sits outside a travel agency with no apparent connection to its surroundings, serving only as a reminder of earlier times. 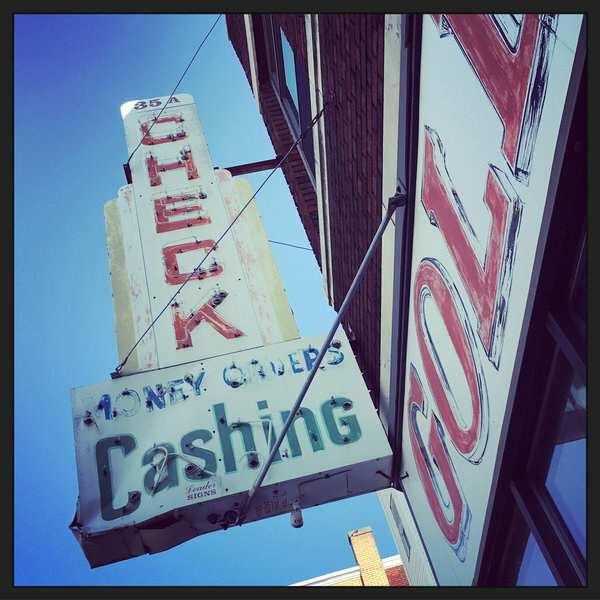 A Check Cashing sign in Worcester, Massachusetts. Image by Susan Bregman. One sign that almost didn’t make the book was a rusty relic in New Haven, Connecticut. It was so rusty I could barely make out the word S-K-A-T-I-N-G. And I initially had so little information, I didn’t know whether the skating in question was roller or ice. After striking out online, I made a few phone calls to local institutions. Armed only with an address – and even that turned out to be wrong – I eventually uncovered the story of the New Haven Roll-A-Round. Thanks go to Ed Surato at the New Haven Museum, Allison Botelho at the New Haven Free Public Library, and the folks at the New Haven Department of Arts, Culture, and Tourism. You guys helped bring an almost-dead sign back to life, at least on the pages of my book. The former sign of the New Haven Roll-A-Round. Image by Susan Bregman. I also got lucky with a sign in Bangor, Maine. I spotted an old free-standing sign that just said M-O-T-E-L. No name. I tried calling a nearby motel to see if it belonged to them, but never got an answer. Without a business name, I couldn’t get too far online. So on a hunch I called Bangor Neon, a family-owned sign shop. Bingo. Robert Treworgy, who founded Bangor Neon in 1948, installed the sign for the Queen City Motel in the 1960s. Another neon mystery solved. The sign of the Queen City Motel in Bangor, Maine. Image by Susan Bregman. This is the reality of the neon landscape. Although some signs will likely remain mysteries, others had tales to tell. And I was delighted to share those stories with you in New England Neon. Susan Mara Bregman has been a writer and photographer for most of her life. She began photographing old neon signs in the Boston metropolitan area around 2012 and quickly fell in love with these landmarks of light. Now she finds herself on a mission to document New England’s neon landscape before it completely disappears. If you’d like to see more of Susan’s brilliant photography and neon detective skills, check out her new book New England Neon below! Does your city have a mysterious neon sign? Let us know in the comments!